Diet: Changes depending on the season and availability of food. During the warm months, the striped skunk will eat insects, beetles, bees, fruit and roots. During the colder months, the striped skunk will eat small mammals such as mice, shrews and chipmunks. 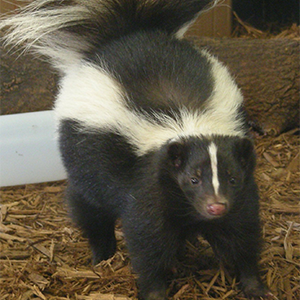 The striped skunk is able to direct the stream of musk up to 10 feet and the smell may carry up to one and a half miles downward.